Creating the perfect peacock ensemble for a bridal party has never been so fun! As modern brides start pulling away from traditions like all-matching bridesmaid’s dresses and black simple suits, it allows a newer market of young and fun bridal party attire to make it’s debut! Modern brides love using different styles for each bridesmaid dress. Finally, brides are considering their bridesmaids and letting them select a figure flattering dress that is as unique as they are! When done right, this idea of mismatched dresses coming together can create a beautiful wedding party. Using one of our favorite bridal attire designers, Jim Hjelm, we put together some unique bridesmaid looks inspired by this month’s theme: peacocks! When you are creating a collage of gorgeous dresses there are many ways to do it! One simple way to make sure all your dresses look great together is by sticking to one length and one fabric! This dress combination is inspired by peacock feathers and the metallic hue they have. Also, the common trait of a black accent on each ties the whole look together. By having two dresses in the same color and two dresses in accent colors all with different necklines, it really emphasizes a fashionable approach to dressing your bridesmaids! Bolder peacock hues and a burst of volume make these mismatching bridesmaid dresses strike a cord together. What makes these dresses mesh? Each dress is above the knee with a similar shine and fabric in different jeweled tones. Also, each dress has a different section of volume to give your girls that extra pop! These dresses are sure to give your wedding a unique yet fashionable twist. Two colors, four amazing Jim Hjelm dresses. This is a simpler color palette for a peacock wedding but what it pulls from the theme is drama. 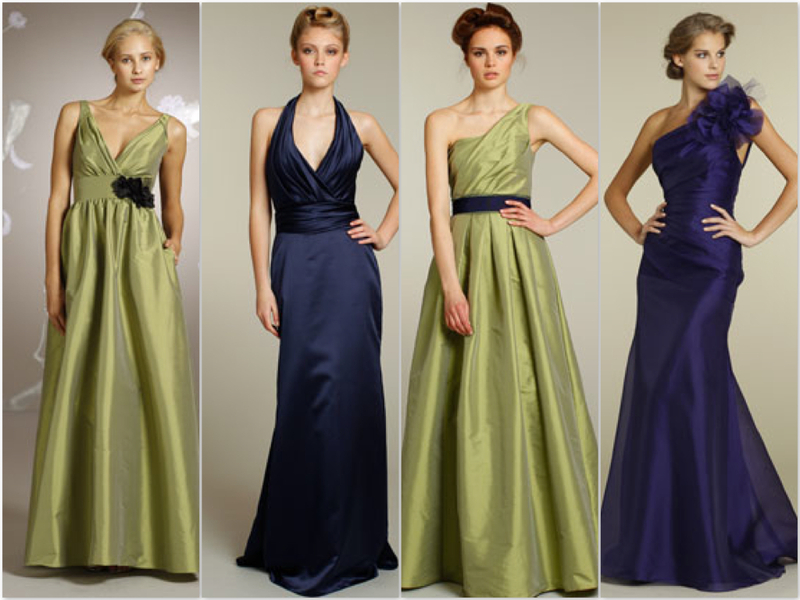 Each dress is distinctive and dramatic ensuring you to have four stunning bridesmaids! The length lends a sense of formality. Not to mention, the length would help keep your girls warm during the cold winter month of January! Since these dresses are so dramatic, sticking to two necklines and simple up-dos will really let the dress speak for itself. Don’t forget that here at Trends to Traditions, we are available to order any of the Jim Hjelm Occasion dresses! Mention this blog post to receive 10% off your order. If you are interested in ordering one of his dresses, call us at 412-267-2108. Like our blog? Then you’ll love our Facebook page! Make sure to “Like” us while you’re checking out all our wedding photos! We also have a Twitter, so follow us at @TTTWeddings for updates and everyday wedding topics. One last thing… Remember to enter our January peacock linen contest! We just enhanced the prize. The winner will get to see their design used in a real mockup wedding tablescape! Winners are picked at the end of January so email your designs straight from our linen tool to socialmediattt@gmail.com. Check out this blog post for more info! Many of you may not be familiar with Jim Hjelm, however, to those of us who live in the wedding world, Jim Hjelm is a very well known designer for bridesmaid dresses. Within the last month, Jim Hjelm’s Spring 2012 Occasions dresses were released to distributers (including us, here at Trends to Traditions!) Now that the collection has been published online and can be viewed by anyone and everyone, we wanted to give you our official review of these new dresses. Half of this season’s collection is made up of short, fun dresses. These dresses look similar to what you would wear out for a night on the town. His dresses are not drab, dull, or something you would want to hide in the back of your closet. These dresses are fashionable and a breath of fresh air in comparison to bridesmaid dresses of years past. A personal favorite is the Ivory pointe d’espirt strapless A-line bridesmaid dress; this dress is simple and elegant, with no potential of upstaging the bride. The belt around the waist saves the dress from being shapeless and gives it gentle definition. Even though the dress is a bit on the minimal side, with its simplicity, it is one which definitely could be worn again whether to another wedding or perhaps a semi-formal work party. Whatever dress you end up choosing, know that if you go with one of Jim Hjelm’s Spring 2012 Occasion dresses, you won’t be limited to wearing the dress only once. Don’t forget that here at Trends to Traditions, we are available to order any of the Jim Hjelm Occasion dresses! If you are interested in ordering one of his dresses, call us at 412-267-2108; mention this blog post to receive a 10% discount on your bridesmaid dress!